If any of your guests or family are gluten-intolerant be sure to use gluten-free oats and almond flour. Don’t substitute regular flour, that’s a whole different recipe. You could make this into 2 smaller quiches if you only have smaller pans. Just be sure to not overload the filling. You will need a 9-1/2” tart pan with high sides, or glass pie plate for this recipe. Preheat oven to 350 degrees. Whiz the oats in a food processor (affiliate link) until finely ground, add the almond flour and salt and pulse 3 times. Now add in the butter and pulse until combined. Add the egg and whiz for about 5-10 seconds. It will form a ball but will still be quite wet yet moldable. Remove the dough from the food processor (affiliate link) and form the dough into a disk. 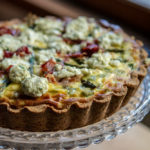 Place it in the quiche pan, and using your fingers or a flat bottomed measuring cup, press the dough into the bottom and up the sides of the pan. Try to keep it even throughout. Place in the oven and bake for 30-35 minutes, until the crust is golden brown, and the house smells like nutty heaven. Remove from the oven and let cool for a few minutes. The crust can be made a day ahead of time. Just let it cool, cover it well and store it on the counter. If you prefer to store in refrigerator you may want to pop it in the over to ‘refresh’ before filling and baking. The fridge can make the crust soggy. While the crust is baking, prepare the veg mixture. You are now technically multitasking! In a medium size bowl, beat the eggs well. Add the cooled veg mixture to the eggs and mix well. Add half of the goat’s cheese. Season with remaining kosher salt and pepper. Pour into the prepared tart pan. Arrange the asparagus tips on the top. Place folds of the prosciutto on the top, so it gets nice and crispy. Bake for 50-60 minutes, until the center is almost set, and the top is golden brown. Dot the remainder of the goat’s cheese on the freshly baked quiche. Let the quiche rest for about 15 minutes before serving. You can certainly bake all the goat’s cheese but I like the flavor of it uncooked. Adds a bit more zing! All you need is a fresh green salad with a tart lemon vinaigrette to cut the richness, and you are set. So satisfying and delicious.